Before we get started - just a reminder that we offer Fine Art Prints and Metal Prints. Fine Art (or Giclée) ink prints, use Epson printers with premium archival ink in 8 colours to provide high-quality prints with wide colour spectrum. Giclée prints are offered on different high-quality papers. Prints are shipped flat (not rolled up) for sizes as large as 30" x 40". Metal Prints: Photographs are infused into metal for a durable print with an almost magical luminescence. Ready-to-display Float Mounts or easels are available. Metal Prints come in five different surfaces: High Gloss, Mid-Gloss, Satin, Sheer Gloss and Sheer Matte. I offer each type in various sizes - but if you ever have a need for a size that isn't listed (or if you have any questions at all) please email me. Also, if you're looking for something that isn't listed on the website (such as Canvas Prints, Greeting Cards, Calendars, Framed Prints, etc) just ask! (I've only listed Fine Art and Metal Prints as I believe those are of the highest quality - but I'm flexible). Step 3: If you're on a gallery, click or tap a photo to view one photo at a time. If you're ordering from the blog simply click on the article featuring the photo of the week you're interested in. 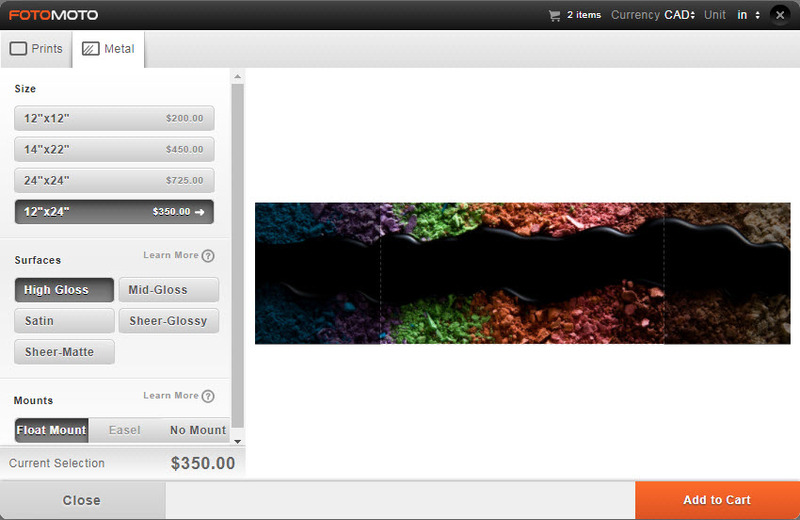 Step 4: Select "Add to Cart"
Step 5: Choose Prints or Metal. Then choose your Size and your Paper or Surfaces. Step 6: If you've selected Metal, select a Mount and a crop area. Step 7: Once you've made your selections click or tap Add to Cart. Verify your order and click or tap Check Out. Enter your shipping information and pay for your order. Let me know if there's anything you'd like to see on the website or in the store by leaving a comment below. Also, don't forget to follow me on Facebook, Instagram, Twitter and Pinterest. Abstract light and mirror sculpture.